The linen closet often falls into the same category as the junk drawer or entry closet – it’s a magnet for disorganization. We often can’t tell which sheets are what size or if we still have the pillow cases to match. Although folding the perfect fitted sheet will always be a mystery to me, below are some tips to keeping the linens straight! In keeping with the theme of the rest of our closets, you must begin by taking everything out and sorting items into groups. Put all sheets together, blankets together, towels, etc. Within the sheet pile, match together complete sets. Once everything is laid out, let go of whatever you do not need or love. It is nice to have to multiple sheet sets per bed, but anything else may too much. This may throw you for a loop, but we recommend storing the sheets in the same room as their corresponding bed..This means that guest sheets go in the guest room closet, and master sheets in the master closet. This makes them much easier to access and alleviates any confusion. You would also obviously keep towels in their correct bathroom and put overflow in the linen closet. 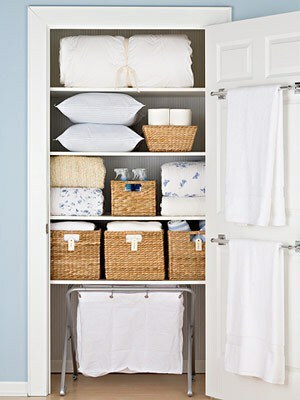 With the remaining linens in your closet, label the shelves so you are clear on what everything is and where it belongs. For example, extra towels for the guest bathroom get stored under the label “Guest Bath Towels,” and sheets for the bed in the guest room go under…you guessed it, “Guest Room Sheets.This makes everything clear, tidy, and easy to grab and go!